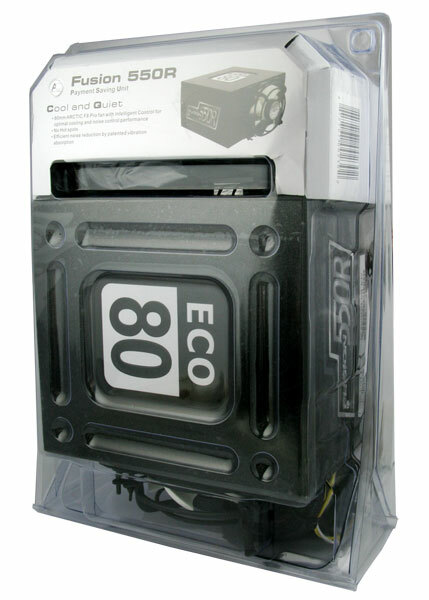 Today we are looking at a new PSU from Arctic Cooling that takes a look at energy efficiency in a whole new way. 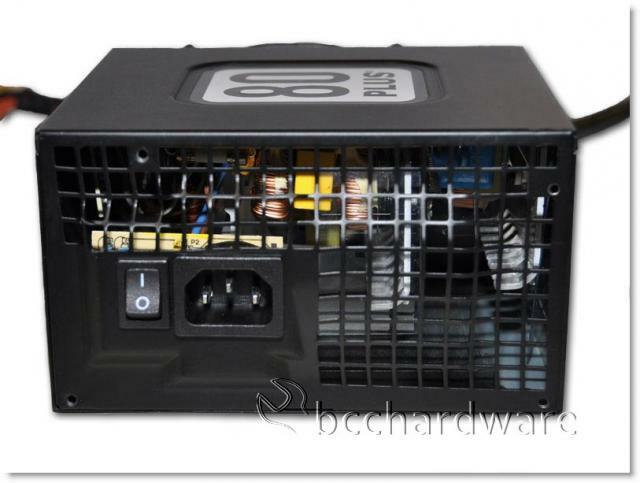 Traditionally, "PSU" in an acronym for "Power Supply Unit", but Arctic Cooling believes they have something special as they label this a Payment Saving Unit. While an inefficient computer certainly can cost you a bit extra at the end of every month, the cost for most homes is negligible. However, if you multiply that cost by a thousand times and put this PSU in every computer in an office building, the savings could be tremendous. We'll take a closer look at the energy efficiency and PFC values as we carry on. 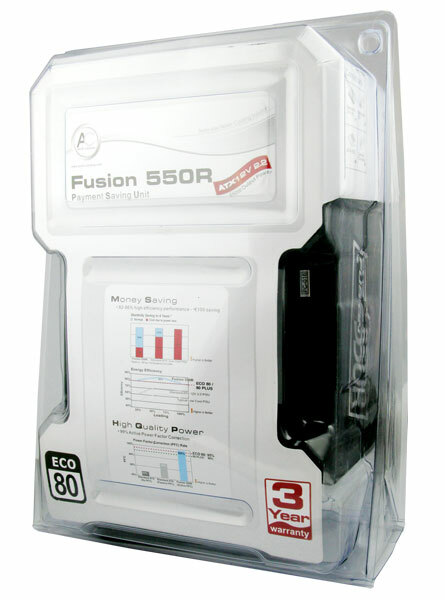 The Fusion 550R comes well packaged in an interesting clamshell. Most PSUs come in a cardboard box of some sort, but Arctic Cooling is grabbing the consumer's attention with something different. Thankfully the package is easily opened and you don't need tools, Band-Aids or assistance to quickly and easily pop this unit out. Unfortunately this handy package also makes it much more difficult to put back together. One of my major beefs with the packaging is that it doesn't show the PSU specs anywhere. The only place they are listed is on the sticker that is on the underside of the package. There are general features and that sort of thing, but no ripple/noise limits or wattage output details of the different rails. 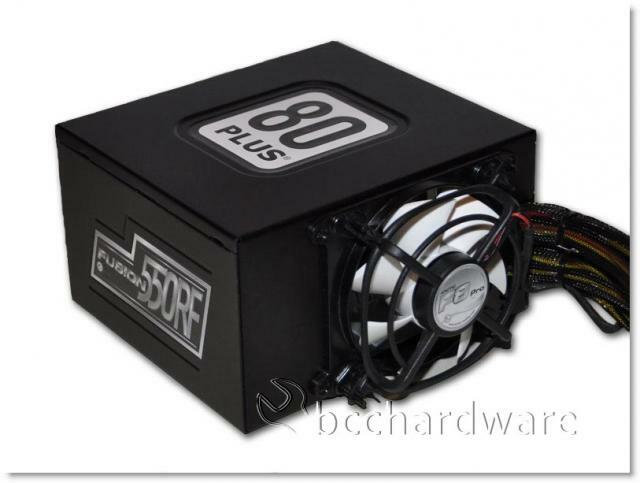 This PSU ties the Tuniq Potency 550W PSU as the lowest-wattage PSU we've looked at for a long time and although we didn't compare the two units directly, it's hard not to take a look at two units that have similar specs without making some comparisons. 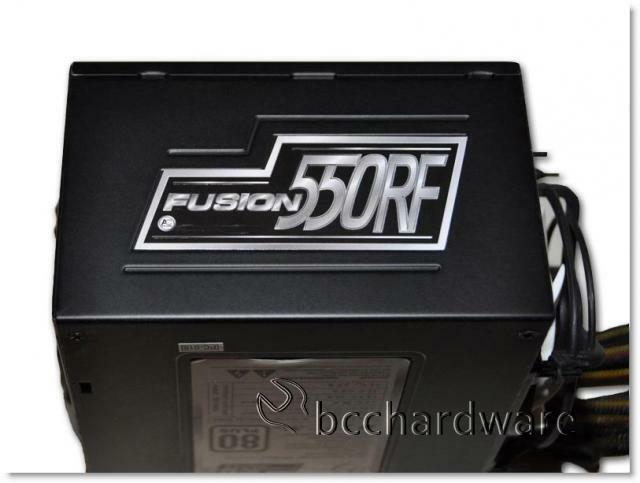 The Arctic Cooling Fusion 550R starts things off by being different. Instead of having the fan hidden away on the inside the metal box, it sits outside the unit and will be located inside the case. It has a small, cheap fan-guard the will protect the fan from large objects from entering, but you'll have to take care not to get any cables stuck in the fan. You'll also have to be careful not to pick up the unit by the fan guard or put too much pressure on it or you'll snap off the plastic guard very easily. You may notice that the rear of the PS is pretty plain and only has the power connector and a simple switch. 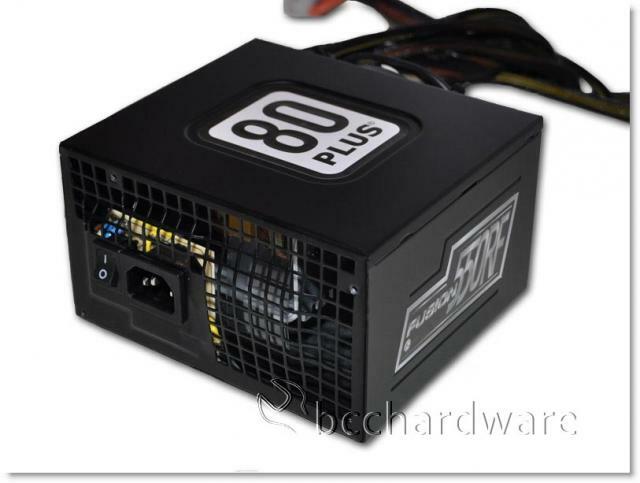 This PSU has active PFC correction and can switch between 100v and 240v without missing a beat. Unfortunately, the specs over at the Arctic Cooling site just mention 200v - 240v as is popular in Europe. It does however work on 60Hz/120v just fine. Like many other companies since the lawsuit filed by Ultra Products, Arctic Cooling has opted to save the $5 royalty per unit and gone with a non-modular design. I'm not sure if I'm a fan as these cables seem a bit lean, short and cluttered, but that just my preference. On the next page we'll take a look at some of the features and specifications of this PSU before we tear into it.